Drilling is only the stage for water supply. When the drilling works are finished, it is necessary go get the water, ie., direct ensuring for users. 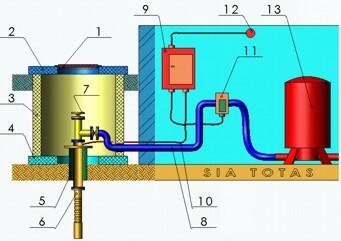 Water supply can be realized via various pumps. Due to the drilling data and characteristics of drilling, our specialists shall get and mount the required water pump device. In order not to have any problems of system functioning within winter period, it needs to be deepened lower than freezing depth (1,0 – 1,5 meter). For that purpose, reinforced concrete rings deepened in appropriate depth are installed above the drilling mouth. Covering pipes of drilling are cut lower than freezing level and hermetic cap is applied to it. In order to avoid passing of gravel water in the drilling, hydroisolation must be applied to the bottom of well and seams of rings. Such construction is advantageous, simple and convenient for pump exploitation and maintenance of water supply system. Company has huge experience in pump device mounting and water supply systems. As well as regarding the data of chemical analysis, we will also offer the appropriate filters and purification systems. In mounting process, we use ecologically pure certified materials produced by leading local and foreign companies, such as, CALPEDA (Italy), GRUNDFOS (Denmark) and others. Automatized management or immersed pump is provided by membrane beacon, as well as pressure relay and control station which are able to maintain constant pressure in the range of 2-4 atmospheres upon interaction. Thus, specific analogue to the urban water supply system is created.